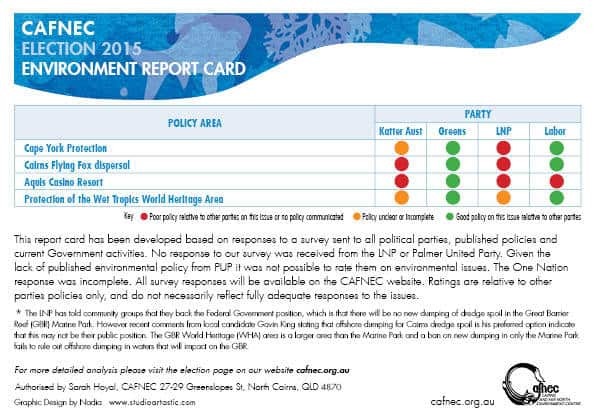 CAFNEC have released a summary report card on the political parties policies on the environment for the 2015 Queensland state election on Jan 31st. The scorecard can be downloaded as a pdf here: CAFNECElectionReportCard_web, and can be viewed below. Full detail of the parties responses to our survey are available here. 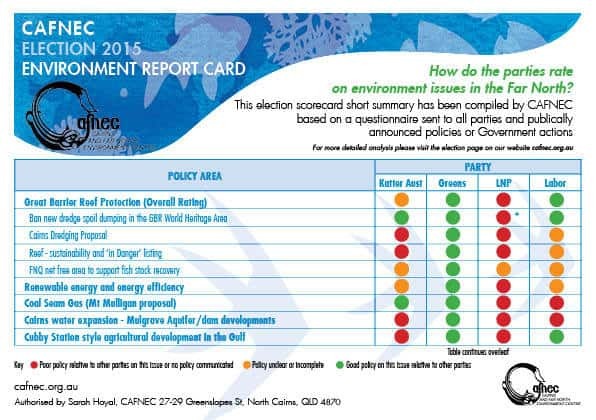 Late breaking news: Labor has released new policies on fishing, including a commitment to a Net Free Area for Cairns. This means that Labor now earns a ‘green’ traffic light for the ‘FNQ net free area to support fish stock recovery’ category. Remember to VOTE FOR THE ENVIRONMENT this election!